This print ad from Kyocera, a Japanese mobile phone company, uses stylish graphics, Japanese symbols, and Western art references to create a powerful visual counterpoint to their message of East meets West. But that's not all -- mobile devices are often marketed as lifestyle products, and the myth underlying this striking image may surprise you. The ad starts at the bottom right with our attention caught by a woman facing us with her soulful gaze directed out of the frame. From her windswept hair, we see a mass of black butterflies sweeping up and back towards a red sun in the top left corner that contains a mobile phone in the center. The butterflies appear to be flowing in to and out from the phone. There is text on the page, but it is shown in an unobtrusive small gray font. The text next to the image is in English but evokes Japanese poetry, and is concluded with a kanji-like symbol representing Kyocera. At the top right, in isolation, we see the Kyocera company logo which unites black and red, the same color used in the rest of the ad. There are many forces at work here, so let’s start with the red sun. It is clearly also meant to represent the Japanese flag. Kyocera is a Japanese company, and by putting their product at the center of the flag, they are making a very deliberate association between their product with the country. The kanji-like representation of the company also bolsters this association. 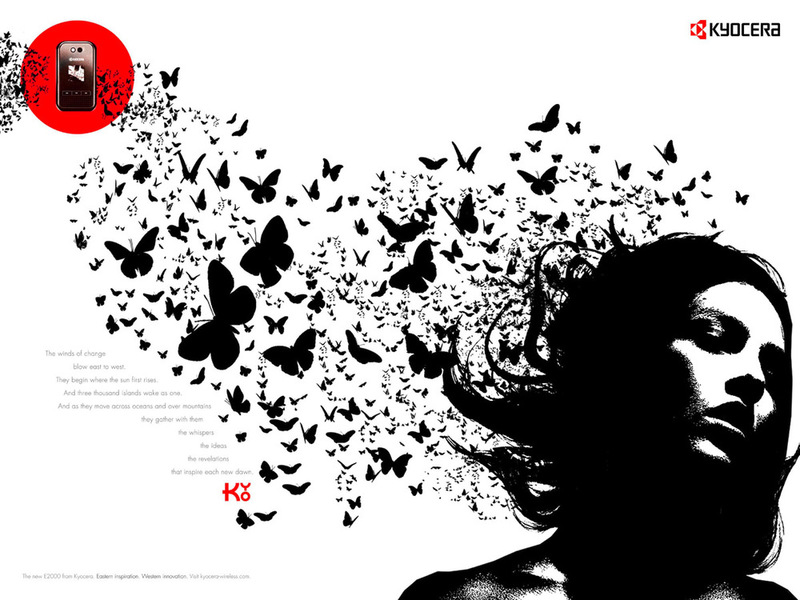 The butterflies and girl, however, are a direct reference to an image that has gained considerable distribution in the West through a t-shirt design from the popular online clothing store Threadless.com called Flowers in the Attic. In this image, a girl is shown with a gun pointed at her head, which has become a bloody pulp that transforms into butterflies. By referencing a work of art created in the West, the ad for Kyocera fulfills its slogan “Eastern Inspiration. Western Innovation.” In this case, however, the inspiration comes from the West and the innovation from the East, so it is an odd juxtaposition of word and concept. Butterflies are also a very important symbol in Japan, symbolizing both the soul in transformation and the female or girl as is referenced in Madame Butterfly (Hearn, “Insect Studies: Butterflies”; Holt, par .12). The trail of butterflies emerging from the girl and entering the phone symbolize the soul of the user flowing through the phone. As a medium for communication, the mobile phone is often mythologized in advertising as a form of identity and self-expression, and this ad is no exception. The ad implies that the phone is a vessel for only not creative expression, but for the user’s very soul and as such, a tool of self-actuation. Pretty insane, yeah? Watch a Japanese pagoda and the Statue of Liberty set the stage for East to meet West in a video commercial from the same campaign.